It was the middle of the morning on Christmas Day and the sun was hot enough to burn. The beach was crowded but the only Thais were the boat taxi men, calling out “boat-boat” from under their awning when anyone went near. The rest were Western backpackers in boardies, bikinis and Santa hats. 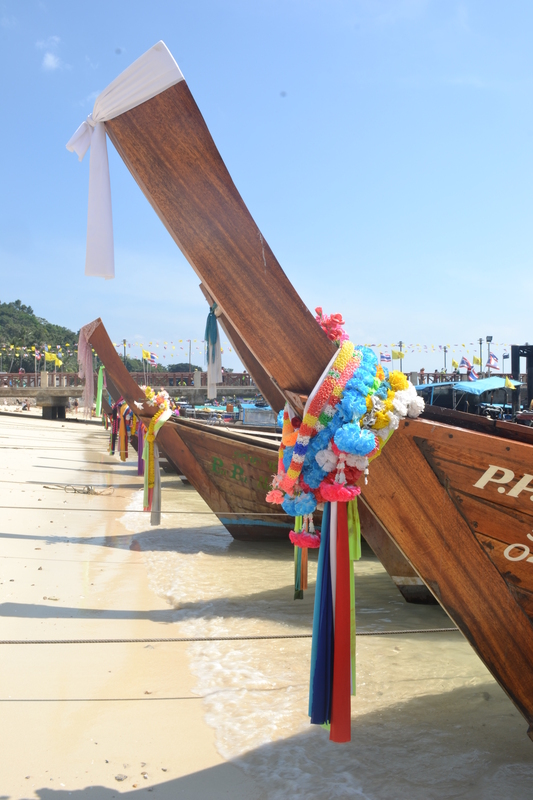 They sprawled on the sand and frolicked in the waves and lined up the empty Singha beer bottles. One prattled about finding a turkey to roast, saying much the same thing a few dozen times, as if polishing a phrase for a piece he was writing. “Hey mate,” another shouted to every guy on the beach, “What’s your best ladyboy story?” As if everybody had several, and would happily share. I crossed the isthmus to the quieter, second best beach and sat on the sand near an empty bar where Errol Dunkley sang Ok Fred and Bob Marley was jamming. 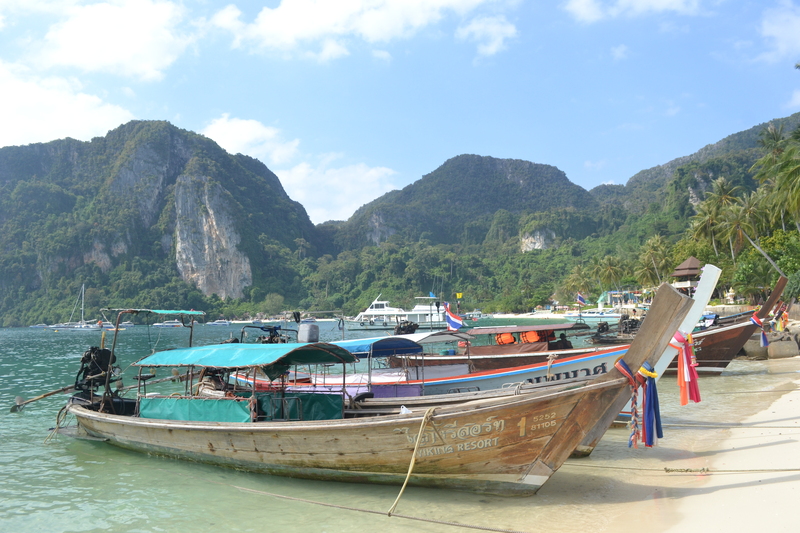 Longtail boats, moored in a line, nodded at the edge of the beach. A small yacht dropped its sails and slid into the harbour. The owner of a sports cruiser started its engines and revved them a few times, filling the air with a sound like a supercar underwater. I found a restaurant by chance when I cut through an alley where an old lady sat mending socks in a doorway and a skeletal man pumped air into the tyre of a rusty bike. The walls were jerry-built from reclaimed wood and the tables and chairs were cheap plastic things intended for a garden. But the eyes of the fish on ice in the doorway were inky black and their gills were cardinal red. There were none of the tacky Christmas songs I had heard from the restaurants I had passed in the middle of the village. It was, after all, just a regular Tuesday in Thailand. A little silver tabby sat down beside me and let out a spare any change meow. I gave her a piece of grilled snapper, and then heard a different meow. It was a poor old red Persian with a sneeze and battle scars and one ear folded down. We agreed to share the fish three ways. They let me eat all the rice. haha, funny, they don’t wonder if someone goes to search ladyboys, but how it was. At least there weren’t men disguised with the winter clothes of Coca Cola’s Santa Claus, as occurs in other places in the southern hemisphere.